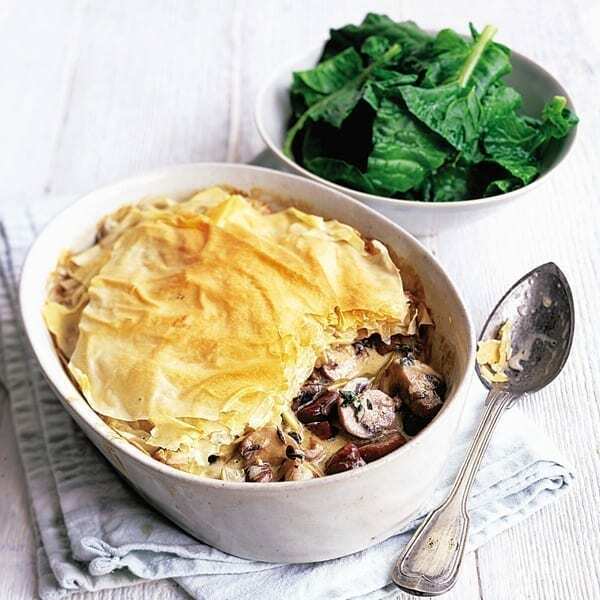 A flavoursome vegetarian mushroom and chestnut filo vegetarian pie recipe that can be made in just 30 minutes. Melt 40g of the butter in large, deep frying pan over a medium heat. Add the leeks and garlic and cook for 3-4 minutes, stirring occasionally, until beginning to soften. Add the mushrooms, increase the heat to high and stir-fry for 2-3 minutes, until wilted slightly. Add the wine to the pan and bubble until nearly all of it has evaporated. Reduce the heat to medium-low and stir in the chestnuts, cream, lemon juice and half the thyme leaves. Simmer gently for a few minutes, until the sauce has reduced a little, then season to taste. Transfer to a deep, 1.5-litre freezerproof and ovenproof dish and cool completely. Stir the remaining thyme into the remaining melted butter. Brush half the filo pastry sheets with some of the thyme butter, lay 1 unbuttered filo sheet on top of 1 buttered filo sheet, then brush again with thyme butter. Halve each filo pile through the middle, so you have 8 smaller squares. Scrunch each square, then lay side by side on top of the filling, to give a ruffled filo topping. At this point, freeze or continue cooking to eat immediately. Serve with steamed spring greens. To eat: defrost at room temperature for 8 hours, or in the fridge for 24 hours. Bring up to room temperature. Cook at 190°C/fan170°C/gas 5 for 25 minutes or until the filling is piping hot and the filo pastry is golden. To freeze: cover with cling film, label and freeze for up to 1 month.